Circarama puts you in the middle of the action, completely surrounded by magnificent motion pictures in color. Among the many fascinating places Circarama takes you in “America the Beautiful” are New York Harbor; Times Square; a Vermont country church set against the splendor of the autumn foliage; Williamsburg, Virginia—cradle of American culture; Pittsburgh steel mills; Detroit automobile factories; Midwestern railroad freight yards; Oklahoma cowboys rounding up cattle; wheat-harvesting combines in Montana; copper mines in Utah; Monument Valley; Hoover Dam; The Grand Canyon; San Francisco; The Golden Gate Bridge; and campus life at America’s great University of California at Los Angeles. Yes, it’s free. There’s no need to reach for your ticket book or to stop at a ticket booth. You can thank The Bell System and your local host company, Pacific Telephone. This presentation puts you “in the middle of everything.” Eleven movie screens form a circle above your head. Eleven perfectly synchronized projectors show eleven 16mm films, surrounding you with a 360-degree travelogue. Most other guests are staring at the front screens. But they’re missing half the fun. The whole idea is to look all around to see what’s going on, even if the filmmakers seem to be directing your attention primarily to the front of the theater. If you’ve seen this movie too many times—after all, it’s a free attraction—here’s how you can have an entirely new experience: Watch the entire movie facing back screens. See where you’ve been instead of where you’re going. The name Circarama is a play on Cinerama, the three-film, three-projector process used to show some Hollywood features on wide, curving screens in specially-equipped movie houses. Does this mean 360-degree movie houses will be next? Although Circarama is not planned for theatre use at present, Mr. [Walt] Disney, for one, does not rule out its potential adaptation to a highly specialized form of dramatic motion picture presentation. It was less than a decade ago that experienced Hollywood showmen failed to recognize the commercial possibilities of Cinerama, when its late inventor, Fred Waller, held demonstration showings in a barn in Oyster Bay, N. Y.
America the Beautiful in Circarama opened at Disneyland in June 1960. But it wasn’t the first Circarama movie. That honor went to A Tour of the West, presented by American Motors—builder of Hudson, Nash, and Rambler automobiles—and its appliance division, Kelvinator. A Tour of the West was an original 1955 attraction at Disneyland. (There’s no word on whether Romney took his eight-year-old son to the opening of the attraction.) 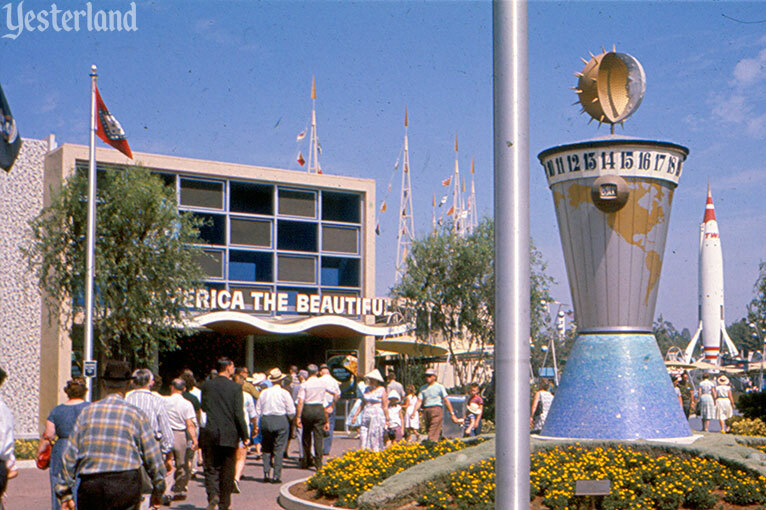 It closed around the beginning of 1960 to make way for America the Beautiful. 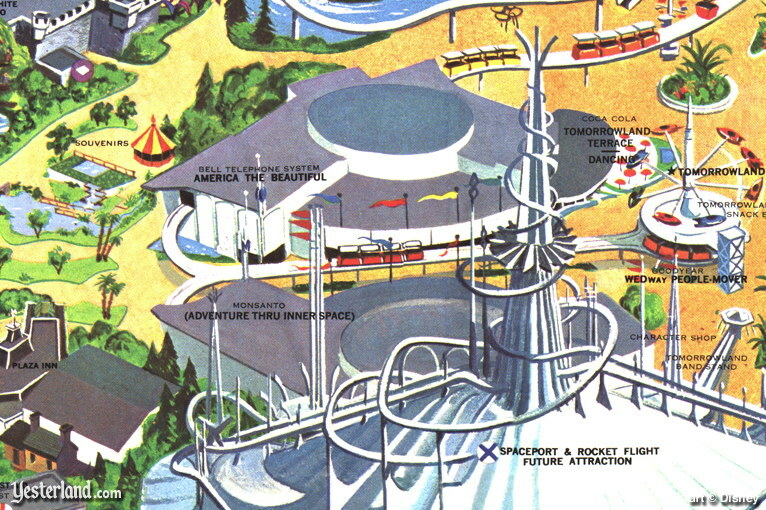 Walt Disney’s involvement with the 1964-65 New York World’s Fair is well known. Far fewer people know that six years earlier, a Disney attraction was part of another Cold War era international expo, the 1958 Brussels (Belgium) World’s Fair. Innovations in photographic and movie projection methods will permit a 360-degree view of “the face of America” on a room-circling screen. The projection method, developed by Walt Disney, is known as “Circarama”. A color film, titled “America: The Land and The People,” showing a trip across the country, will be exhibited. By the time the fair opened, the color film had a new name. Walt Disney’s America the Beautiful was a highlight of the American pavilion. The next stop for Circarama was the American National Exhibition in Moscow, Russia in 1959. The U.S. Government arranged for Walt Disney to redo the narration of America the Beautiful in Russian. 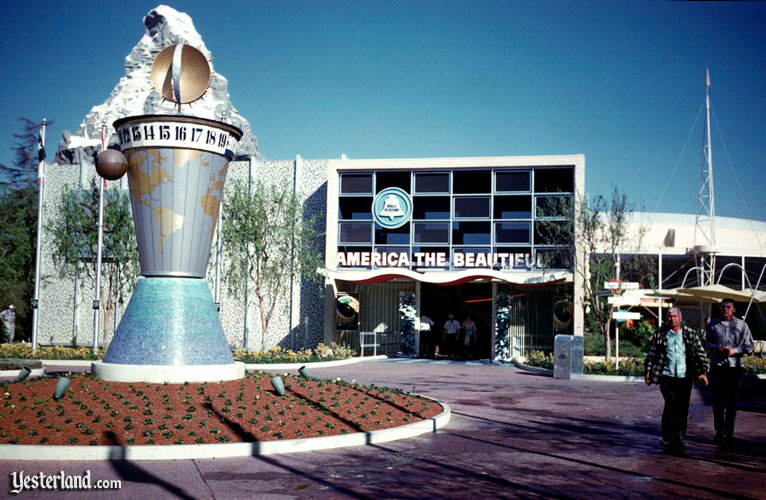 By the time America the Beautiful opened at Disneyland in 1960, it was the third version of the 360-degree movie, playing in its third country. 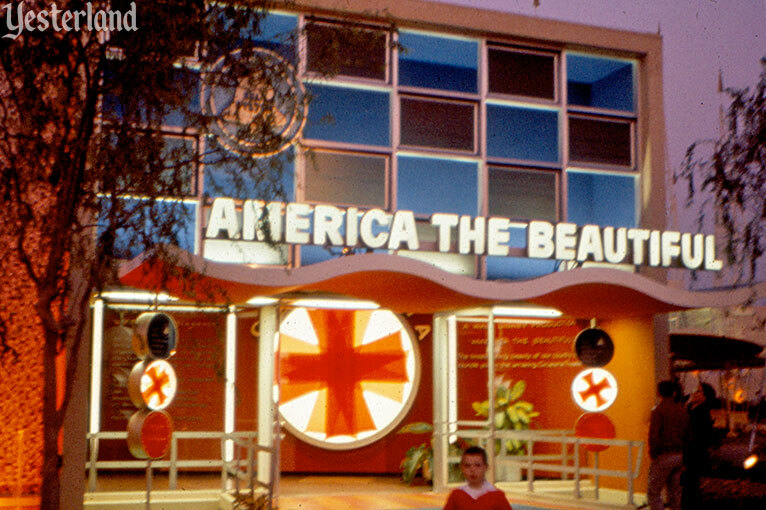 The eleven-screen America the Beautiful attraction at Disneyland closed permanently in September 1966. America the Beautiful was replaced by… America the Beautiful! Despite having the same name, the 1967 version of America the Beautiful was an entirely new movie. This time, it was filmed in the new nine-screen Circle-Vision 360 process, and was shown in a much larger theater using nine 35mm movie projectors. 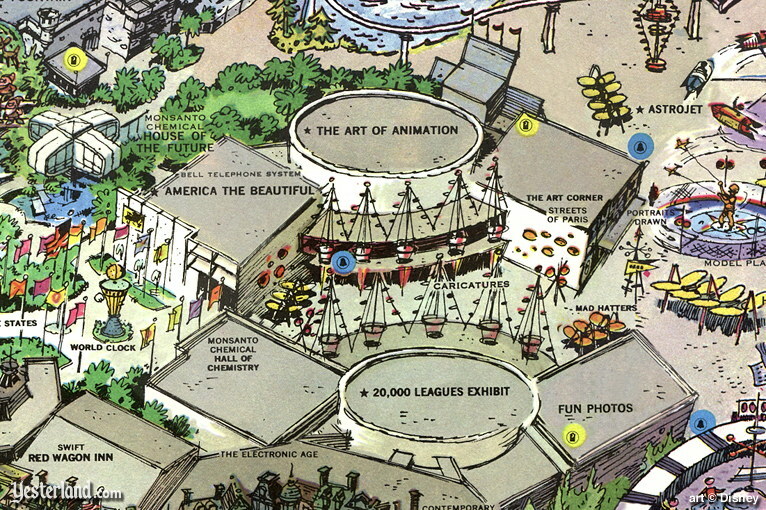 The original Circarama was housed in only the left section of the north Tomorrowland building, and that space was also used for exhibits. When the New Tomorrowland opened in 1967, the left section became the pre-show area where guests would wait. 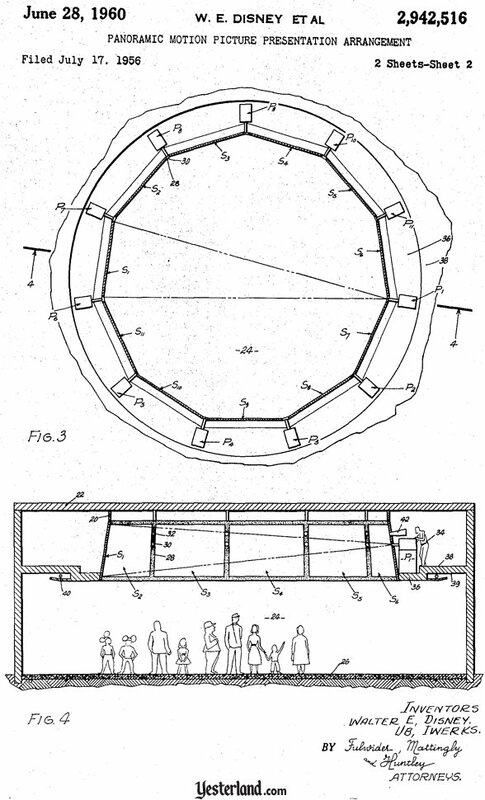 The new Circle-Vision 360 theater took up the round central section. Today, both sections are used for Buzz Lightyear Astro Blasters. 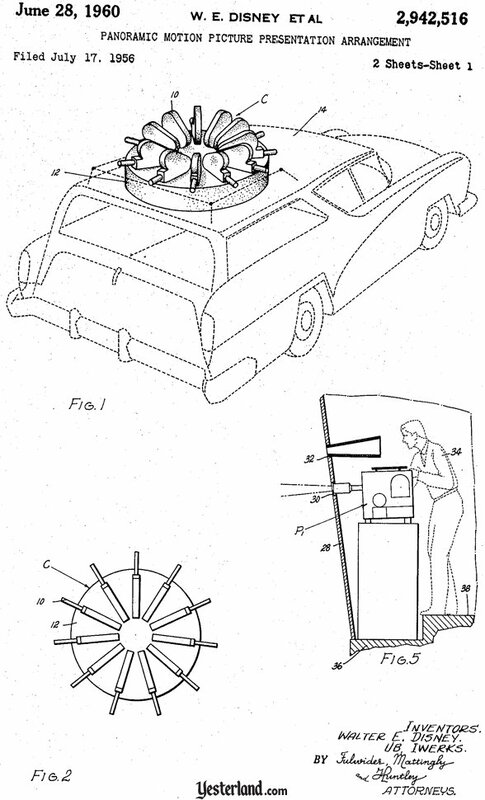 Circarama was such an ingenious, original idea that Walt Disney had it patented. Notice that the patent was filed on the first anniversary of Disneyland’s press opening and awarded the same month that America the Beautiful opened at Disneyland. 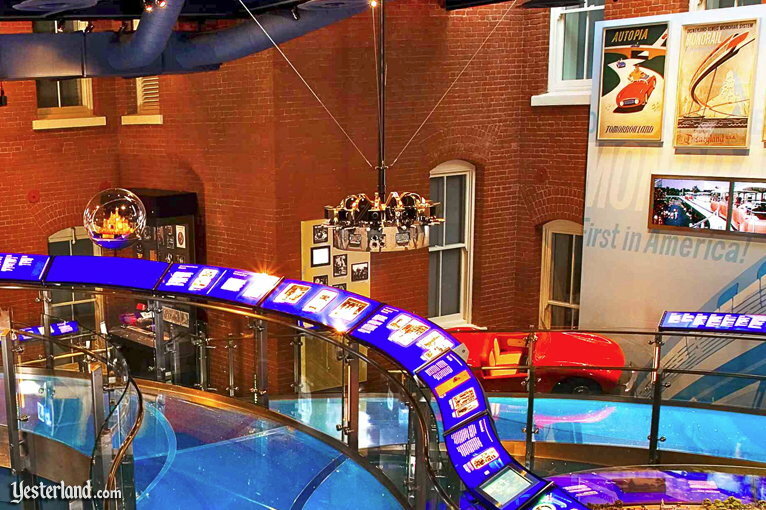 When you visit the Walt Disney Family Museum in San Francisco, be sure to look for the original Circarama camera.